Vote for PLIA Volunteer Neil Santos! On August 24, a team from WFXT Boston 25 came to the lake to profile Neil as one of three finalists for the Boston area Cox Conserves Heroes award.. The announcement was aired on September 5 and you can vote for Neil as your favorite hero at http://coxconservesheroes.com/boston/finalists.aspx. PLEASE VOTE SOON and share this story with friends so that others can join you to make Neil the 2017 Boston Area Cox Conserves Hero! 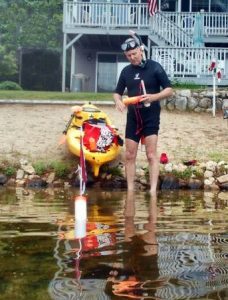 Neil’s work has enabled both lake residents and Pawtuckaway State Park visitors to continue to use the lake without restriction or other impact. In addition to this honor there is a grant awarded to the recipients to donate to their favorite nonprofit organization, and Neil has chosen the PLIA! How do I send u a photo?